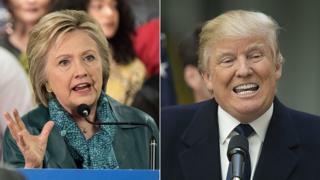 US presidential front-runners, Democrat Hillary Clinton and Republican Donald Trump, have continued their winning streaks, taking Arizona. Keeping his campaign in the race, Democrat Bernie Sanders decisively won caucuses in two smaller states, Idaho and Utah. The Utah Republican caucuses were won by Texas Senator Ted Cruz. He also received a welcome boost with the endorsement of former Florida governor Jeb Bush, who pulled out of the race last month. Hillary Clinton and Donald Trump effectively held serve in Tuesday's slate of primaries and caucuses. Both posted sizable wins in Arizona, which - thanks to the state's population - balanced out losses elsewhere. For Mr Trump to have a realistic path to securing the Republican nomination before the party's convention he needed Arizona's winner-take-all primary. The state proved to be fertile territory for the front-runner's anti-immigration, border-security pitch. Mr Trump is still on pace to near the magic delegate number of 1,237. Unless momentum changes significantly, it's going to be a nail-biter. The New Yorker's Utah loss was notable for its size, denying him any delegates there and proving that while Mr Trump has broad appeal among Republicans, that does not extend to the state's sizeable Mormon population. There's only one Utah, however, and many more states ahead that could be friendlier to Mr Trump. Mrs Clinton's comfortable win over Bernie Sanders in Arizona was more surprising, as the Vermont senator had invested considerable resources there. He dominated the smaller Utah and Idaho caucuses, however - offering further proof of his appeal in states with a less diverse voter pool. Mr Sanders made little, if any, headway in the delegate count, however. He needs more big wins, without setbacks like Arizona - and soon. During a victory speech in Seattle, Mrs Clinton addressed the terrorist attacks in Brussels on Tuesday, pushing back against the Republican candidates' response to the bombings. Earlier on Tuesday, Mr Trump reiterated his plan to ban Muslims from travelling to the US and suggested that the US should torture terrorism suspects. Media captionWhat do Mexicans think of Donald Trump? Arizona residents' preference for early voting, with many mailing in their ballots, may have affected the race. Florida Senator Marco Rubio, who left the race on 15 March, secured more than 70,000 votes.